In early May, scientists from an NSF (RIDGE and MARGINS Programs) and NOAA (Ocean Exploration Program) sponsored cruise on the University of Washington vessel, the R/V Thompson, traveled to the Lau-Tonga region. This rapid-response expedition was undertaken after strong indications of submarine eruptive activity had been detected during a November 2008 NOAA Vents Program expedition. 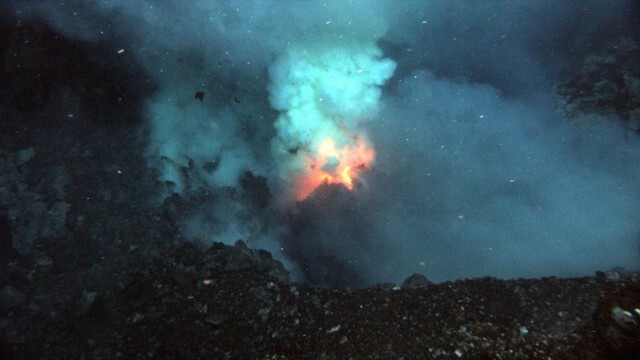 On 6 and 7 May, team members used the Jason 2 ROV to observe eruptions from two vents of West Mata, a small submarine volcanic cone in the northeast Lau Basin, about 200 km SW of Samoa. Explosive activity occurred from one end of a 5-m-long fissure at Hades vent, at a depth of 1,208 m, while pillow lavas erupted from the other end of the fissure. Glowing bubbles up to a meter in diameter also issued from the fissure. The Prometheus vent, a cinder cone located near the summit and about 100 m N of Hades, erupted explosively with nearly continuous lava fountains that ejected tephra into the water. Both vents were often obscured by sulfur gas emissions, but incandescence was visible for minutes at a time. Scientists first detected signs of eruptions at West Mata, a small active seamount ~200 km SW of Samoa, in 2008 when a particle-rich plume was identified ~175 m above the volcano's summit (BGVN 34:06). An eruption site was located in May 2009 (Resing and others, 2011; BGVN 34:12), and found to be still active in March 2010 (Clague and others, 2011). Thus, as of the beginning of 2012, the W Mata eruption has been ongoing for at least 3 years (since November 2008). This report provides an updated version of the one that first appeared in BGVN 36:12 about W Mata volcano (figure 6). Figure 6. Location maps of West Mata volcano. (a) Regional map showing features of the NE Lau basin; inset shows the volcano's location at the N end of the Tonga trench. (b) Detailed bathymetric map produced by the autonomous underwater vehicle D. Allan B during the May 2009 cruise. Remotely operated vehicle (ROV) Jason2 dive tracks along which observations and measurements were made and samples recovered are shown by colored lines. Two eruptive vents, Hades and Prometheus, are located by red dots. Relative lava age assessments are based on visual observations. The line T08C17 was a towed hydrocast with samples taken along the line, and point V08C26 was a stationary hydrocast with samples taken over a range of depths at a single location. These hydrocasts collected temperature data and samples of the plume for chemical analyses. From Resing and others (2011). Baker and others (2012) noted that W Mata volcano, a low effusion rate eruption, was the deepest active submarine eruption ever observed [as of 2011] and had both explosive and effusive phases. Hydrophones moored for two 5-month deployment periods before and after the 2009 seafloor observations recorded variable but continuous explosions, proof that W Mata, like Northwest Rota-1 (in the Mariana islands), is undergoing a lengthy eruption episode. Rubin and others (2012) reported that W Mata represented the deepest witnessed violent submarine eruption to this time (~700 m deeper than currently-erupting NW Rota-1 in the Mariana Islands, BGVN 29:03, 31:05, 33:12, 34:06, and 35:07). It was previously thought that explosive eruptions, which involve expanding bubbles, shouldn't occur below a depth of ~1 km. Basically, as water pressure increases with depth in the ocean, the ability of gas to come out of solution in the magma and cause eruption is diminished. The suppression of bubbles thus limits explosions, but the depth at which this occurs is called into question. Clague and others (2011) suggest that pyroclastic activity at West Mata occurred to at least 2.2 km depth. Presenting a list of ocean depths and locations where explosive processes have been documented, Clague and others (2011) gave the following information (presented here omitting their cited references): "...fine clastic debris formed during pyroclastic eruptions along [West Mata's] rift zones, and coarser talus shed from the lava flows, plateaus, and cones, can be traced upslope perpendicular to contours to the rift zones at depths as great as 2,350 m, suggesting that explosive pyroclastic activity on West Mata is common at least this deep, and much deeper than most theoretical models suggest without extraordinary initial volatile contents or accumulation of volatiles. Previous studies suggest that strombolian bubble-burst basalt eruptions occur along the mid-ocean ridge system for volatile-poor mid-ocean ridge basalt at least as deep as 1,600 m deep on Axial Seamount on the Juan de Fuca Ridge, 1,750 m on the mid-Atlantic Ridge near the Azores platform, 3,800 m on the Gorda Ridge, and 4,000-4,116 m deep on the Gakkel Ridge. Deep water strombolian activity of more volatile rich lavas has also been observed at 550-560 m depth on NW Rota-1 in the Marianas arc for basaltic-andesitic lava, and inferred at least as deep as 590 m depth off shore Oahu, 1,300 m at Loihi Seamount, and 4,300 m for volatile-rich strongly alkalic lavas in the North Arch volcanic field. The distribution of clastic debris on West Mata suggests that boninite eruptions can also be pyroclastic much deeper than the activity observed at the active vents near the summit at 1,175-1,200 m depth." Resing and others (2011) made the following introductory comments (quoted here without most of the references they cited): "Submarine eruptions account for ~75% of Earth's volcanism [White and others, 2006], but the overlying ocean makes their detection and observation difficult. The scientific community has made a concerted effort to study active submarine eruptions since the mid-1980s. Despite these efforts only two active submarine eruptions have been witnessed and studied: NW-1, a much shallower submarine volcano in the Mariana arc, and now West Mata, at 1,200 m depth. Here we describe sampling and video observations of an explosive eruption driven by the release of slab-derived gaseous H2O, CO2 and SO2. The generation of fine-sized clastic materials provides direct evidence for eruptive styles that produce similar materials deeper in the ocean." Boninites. Resing and others (2011) and Rubin and others (2009) noted that among the first lavas to erupt at the surface from a nascent subduction zone are a type classified as boninites. A boninite sample was collected at W Mata by the ROV Jason during the 2009 cruise (see figures 10 and 11, BGVN 34:12). Boninite is a mafic extrusive rock, an olivine- and bronzite-bearing andesite with little to no feldspar, containing high levels of both magnesium and silica. The rock is typically composed of large crystals of bronzite (pyroxenes) and olivine in a crystallite-rich glassy matrix. These lavas are considered diagnostic of the early stages of subduction, yet, because most preserved and observable subduction systems on continents are old and well-established, boninite lavas had previously only been observed in the ancient geological record. Resing and others (2011) found that large volumes of gaseous H2O, CO2, and SO2 were emitted, which they suggested are derived from the subducting slab. The volatiles drive explosive eruptions that fragment rocks and generate abundant incandescent magma-skinned bubbles and pillow lavas. Some examples of various eruptive modes observed in West Mata are shown in figure 7. As at other submarine volcanoes, the volatile-rich fluids found at West Mata fuel chemosynthetic biological activity (figures 7g and 7h). Figure 7. ROV Jason2 photographs depicting West Mata's Hades and Prometheus vents (shown in figure 6(b). (a) Discovery of the eruption at Hades vent seen here with the field of view (FOV) ~4 m across. (b) Active degassing and explosive clast formation at Prometheus vent; white particles are primarily elemental sulphur (FOV is ~3 m). (c) Magma bubble and active degassing at Hades vent, with degassed lava progressing downhill, forming pillow flows (FOV is ~3.5 m). (d) Quenched lava being collected from an active flow; the active pillow is ~0.3 m wide; iset is the quenched sample being stored on the ROV. (e) Pillow lava extruding (~0.2 m wide). (f) At Hades vent, double magma bubble emerging from the vent before breaking apart; the base of the bubble is ~0.5?0.8 m (most of the observed bubbles ranged in size from 0.25?1 m in diameter, with occasional larger bubbles). (g) Microbial flock near diffuse venting between Prometheus and Hades vents. (h) Colony of shrimp near diffuse venting; warm water was collected here; the two red dots are 0.1 m apart. This set of images came from Resing and others (2011); others may be found in Rubin and others (2012). In May 2009, scientists using ROV Jason 2 discovered two sites of active explosive eruption (vents) on the summit of W Mata (Resing and others, 2011). The first vent, Hades, was located on the S end of the summit ridge at ~1,200 m depth, and the second vent, Prometheus, was found ~100 m NE of Hades at 1,174 m depth (located in figure 6b). Figure 7 shows some newly published images from these vents. During a one-week study in 2009, explosive eruptions at both vents were almost continuous with only occasional quiet episodes. Several modes of magmatic gas-driven eruptions were identified and some may have contained significant trapped water. They produced pyroclasts (i.e., spatter, ash and tephra) and abundant fine-grained particulate material composed predominantly of sulfur. The most spectacular eruptive mode observed during the week occurred when erupting gases stretched molten lava to create incandescent bubbles of ~0.2? to 1-m diameter (figure 7c and 7f ). As the lava bubbles burst they produced fine-grained particle clouds devoid of visible gas bubbles. A hydrophone placed nearby recorded distinctive low-frequency sounds. In a less explosive eruptive mode, pulses of gas emitted pebble- and sand-size clastics (figure 7b). These formed mounds of debris through which magmatic gases escaped. Observers also saw pyroclasts and fine-grained sulfur (figures 7a-c and 7f). Another eruptive mode occurred following quiet episodes, when cap rock was pushed aside and incandescent, degassing, molten lava emerged accompanied by low-frequency sound. At other times, the gas passing through the incandescent lava was flame-like in appearance. In both these cases, escaping hot volatiles insulated the incandescent lava from surrounding seawater for prolonged intervals. The general absence of free gas bubbles at West Mata markedly contrasts with the abundance of bubbles observed at the much shallower (520 m) eruption at NW-Rota. This fits with the diminished ability to form bubbles at depth. Clague and others (2011) reported that the autonomous underwater vehicle (AUV) D. Allan B conducted high-resolution (1.5-m scale) mapping during the May 2009 expedition to W Mata that helped identify the processes that construct and modify the volcano. In addition, ship-based multibeam sonar bathymetry had been collected over West Mata during expeditions in 1996, 2008, 2009, and 2010, with the results enabling comparisons over a 14-year period. According to Baker and others (2012), a significant drawback to existing moored arrays is the absence of realtime information, precluding a prompt response to a detected event. This deficiency led to the addition of hydrophones to profiling floats and underwater ocean acoustic gliders. The QUEphone, or Quasi-Eulerian hydrophone, is a new-generation free-floating autonomous hydrophone with a built-in satellite modem and a GPS receiver (Matsumoto and others, 2006). Because it does not have station-holding capability, its main value to response efforts is its potential for rapid deployment by aircraft. Underwater ocean gliders offer a more structured monitoring strategy, as they can be preprogrammed to follow, and repeat, a horizontal and vertical course. Low instrument noise and buoyancy-based drive systems make gliders ideal acoustic monitoring tools, able to navigate around seafloor obstacles and resurface every few hours to transmit data. Matsumoto and others (2011) demonstrated this capability by driving a glider around W Mata volcano and recording the broadband volcanic explosion sounds. References. Baker, E.T., Chadwick Jr., W.W., Cowen, J.P., Dziak, R.P., Rubin, K.H., and Fornari, D.J., 2012, Hydrothermal discharge during submarine eruptions: The importance of detection, response, and new technology, Oceanography, v. 25, no. 1, pp.128?141 [http://dx.doi.org/10.5670/oceanog.2012.11]. Clague, D.A., Paduan, J.B., Caress, D.W., Thomas, H., Chadwick Jr., W.W., and Merle, S.G., 2011, Volcanic morphology of West Mata Volcano, NE Lau Basin, based on high-resolution bathymetry and depth changes, Geochemistry, Geophysics, Geosystems (G3), v. 12, QOAF03, 21 pp, doi:10.1029/2011GC003791. Matsumoto, H., Dziak,, R.P., Mellinger, D.K., Fowler, M., Lau, A., Meinig, C., Bumgardner, J., and W. Hannah, 2006, Autonomous hydrophones at NOAA/OSU and a new seafloor sentry system for real-time detection of acoustic events, Oceans 2006, MTS/IEEE?Boston, September 18?21, 2006, IEEE Oceanic Engineering Society, pp. 1-4, doi:.10.1109/OCEANS.2006.307041. Matsumoto, H., Bohnenstiehl, D.R., Haxel, J.H., Dziak, R.P., and Embley, R.W., 2011, Mapping the sound field of an erupting submarine volcano using an acoustic glider, Journal of the Acoustical Society of America, v. 129, no. 3, pp. EL94?EL99, doi: 10.1121/1.3547720. Resing, J.A., Rubin, K.H., Embley, R.W., Lupton, J.E., Baker, E.T., Dziak, R.P., Baumberger, T., Lilley, M.D., Huber, J.A., Shank, T.M., Butterfield, D.A., Clague, D.A., Keller, N.S., Merle, S.G., Buck, N.J., Michael, P.J., Soule, A., Caress, D.W., Walker, S.L., Davis, R., Cowen, J.P., Reysenbach, A-L., and Thomas, T., 2011, Active submarine eruption of boninite in the northeastern Lau Basin, Nature Geoscience, v. 4, 9 October 2011, pp. 799?806, doi:10.1038/ngeo1275. Rubin, K.H., Soule, S.A., Chadwick Jr., W.W., Fornari, D.J., Clague, D.A., Embley, R.W., Baker, E.T., Perfit, M.R., Caress, D.W., and Dziak, R.P., 2012, Volcanic eruptions in the deep sea, Oceanography, v. 25, no. 1.p. 142?157 [http://dx.doi.org/10.5670/oceanog.2012.12]. Information Contacts: Joseph A. Resing, NOAA PMEL and Joint Institute for the Study of the Atmosphere and Ocean (JISAO), The University of Washington, 7600 Sand Point Way, NE, Seattle, WA, USA (URL: http://www.pmel.noaa.gov and http://jisao.washington.edu); David A. Clague, Jennifer B. Paduan, David W. Caress, and Hans Thomas, Monterey Bay Aquarium Research Institute (MBARI), Moss Landing, California, USA (URL: http://www.mbari.org); William W. Chadwick Jr., Robert W. Embley, and Susan G. Merle, Hatfield Marine Science Center, Oregon State University and NOAA, Newport, OR, USA (URL: http://www.pmel.noaa.gov); Kenneth H. Rubin, Department of Geology and Geophysics, School of Ocean and Earth Science and Technology (SOEST), University of Hawaii at Monoa, HI, USA (URL: http://www.soest.hawaii.edu/). This is the first Bulletin report on West Mata, a small seamount ~ 200 km SW of Samoa, the scene of inferred ongoing eruptions when visited during November 2008 and an unambiguous eruption at multiple vents when visited during May 2009. West Mata is located in the NE Lau basin ~ 35 km E of the closest portion of the Lau spreading center (figure 1) and ~ 70 km NE of a now-erupting portion of the NE Lau spreading center (NELSC). Investigations of this site were made on two research cruises conducted in the region by the research ressel RV Thompson during November 2008 and May 2009. Figure 1. Bathymetric map of NE Lau area showing two eruption areas (circled) discovered during the 2009 expedition, West Mata and NELSC where volcanoes Tafu and Maka are located. Contour interval 500 m. Inset location map shows the Fiji Islands (~ 860 km WNW) and Samoa (~ 270 km NE), along with the East Lau Spreading Center (ELSC), Central Lau Spreading Center (CLSC), and Fonulalei Spreading Center (FSC). Courtesy of Resing and others (2009). Expedition during 13-28 November 2008. During the 2008 expedition, water column measurements were made, including a conductivity, temperature, and depth (CTD) rosette package to characterize the physical and chemical nature of hydrothermal systems. The RV Thompson's multibeam sonar provided high-resolution bathymetry and seafloor backscatter imagery. West Mata volcano (figure 2) was very likely erupting lava flows and/or pyroclastic material at this time. The intense plume rising ~ 175 m from the summit that was characterized by high values of turbidity, hydrogen, delta helium-3 (d3He), oxidation-reduction potential (Eh), and pH. The acoustic backscatter over portions of the volcano was uniformly high, indicating geologically young seafloor. Figure 2. Multibeam bathymetry of West and East Mata volcanoes. Contour interval is 200 m. Taken from Resing and others (2009). Although the marine optical backscatter was dominated by elemental sulfur and particulate iron, there was also an abundance of large mineral and/or glass shards in the plume. The larger clastic materials were composed almost exclusively of Mg-silicates, with lesser Ca-Mg-silicates. These compositions were consistent with the eruption of boninites (glass olivine-bronzite andesite that contains little or no feldspar) that previously have only been observed at inactive volcanoes. These chemical and geological characteristics match well with those of NW Rota-1 in the southern Mariana arc, which has been undergoing submarine Strombolian eruptions for at least 4 years (BGVN 29:03, 31:05, and 33:02). Resing and others (2009) reported that the acoustic backscatter appeared to show extensive deposits of clastic material draping the volcano and extending over a recent lava flow at its eastern end, suggesting a recent and continuous state of eruption. 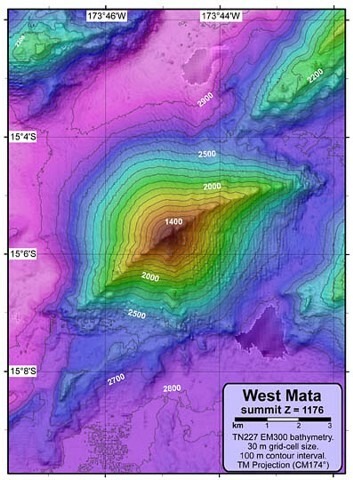 Finally, they note that East Mata (figure 3), a similar volcano ~ 10 km closer to the Tofua arc, is also hydrothermally active, albeit less intense than West Mata. Figure 3. The two Jason ROV dives at West Mata volcano discovered not just one active volcanic vent, but two, Hades and Prometheus. Both vents were obscured much of the time by billowing sulfurous gas emissions, but bright orange lava was seen in both vents. The orange glowing lava was visible for minutes at a time. Text courtesy of Dave Clague (on expedition blog); bathymetric chart courtesy of NOAA Vents website. Expedition during 5-13 May 2009. On 6-7 May, scientists onboard the RV Thompson used the Jason 2 ROV (remotely operated vehicle) to observe eruptions from two vents of West Mata (figure 3), Prometheus (at or near the summit) and Hades (slightly to the SW). According to Dave Clague, writing on the expedition blog, the deeper vent, Hades, sits on the SW rift. It was erupting both effusively and explosively at the same time on both days (6-7 May). Small bursts were occurring at one end of an erupting fissure ~ 5 m long at a depth of 1,208 m, while pillow lavas were being extruded from the other end. By the next night (7 May) the activity had become more vigorous, sometimes blowing glowing bubbles as much as a meter across from the fissure. Clague noted that the second, shallower vent, Prometheus, was located very near the summit of the volcano and about 100 meters away from Hades, the first vent. The eruption here was entirely explosive with low-level, but nearly continuous fire fountains throwing ejecta into the water during both dives. Both vents were often obscured by sulfur gas emissions, but incandescence was visible for minutes at a time. According to an article on the Discovery News website, Jason 2 approached the vent and was promptly buried in ~ 45 kg of debris. Huge gas bubbles, maybe 1 m in diameter, were observed coming out of West Mata. References. Resing, J., Lupton, J., Embley, R., Baker, E., and Lilley, M. (compilers), 2009, Preliminary findings from the North Lau eruption sites, informal report, 2/5/09 (URL: http://www.ridge2000.org/science/downloads/email/Nlaupreliminaryfindings25.pdf). Information Contacts: 2009 Lau Basin Eruption Exploration Expedition (blog), NOAA/PMEL VENTS Program (URL: http://laueruptions.blogspot.com/); National Oceanographic and Atmospheric Agency (NOAA) Vents Program (URL: http:/www.pmel.noaa.gov/vents/); Discovery News (URL: http://dsc.discovery.com/news/2009/06/05/undersea-eruption.html). The eruption of the submarine back-arc West Mata volcano was reported in May 2009 (BGVN 34:06) at 1,200 m water depth in the NE Lau basin. The activity was discovered during a research cruise aboard the University of Washington's RV Thomas Thompson. Ken Rubin, a geochemist at the University of Hawaii, reported that during the 2009 cruise a remote operated vehicle (ROV Jason) was used to observe extrusive and mildly explosive (Strombolian, or the deep-submarine equivalent) activity near the summit. Among the many attributes of this event was the unique style of eruption from multiple active vents. In addition, the lavas were composed of boninite (a lava of olivine-bronzite andesite composition containing little or no feldspar), making this the first observed eruption of a lava of this composition. Such lavas have previously been seen only on volcanoes over a million years old, and are thought to represent the early stages of subduction in primitive island arcs. One of the tasks on the cruise was to sample an active lava pillow. Rubin provided several photographs of the sampling sequence, done with a T-handled rod rammed into a molten zone on the pillow (figures 4 and 5). Some of the sample has been distributed for analysis. Figure 4. Photograph taken from the ROV Jason of a sample of lava from West Mata being placed in a container aboard the vehicle. Courtesy of K. Rubin. Figure 5. Photograph of lava sample collected at West Mata. Courtesy of K. Rubin. According to press release 09-243 of 17 December 2009 by the National Science Foundation (NSF), the expedition's chief scientist and a chemical oceanographer at the University of Washington, Joseph Resing, stated that "we found a type of lava never before seen erupting from an active volcano, and for the first time observed molten lava flowing across the deep-ocean floor." Bob Embley, marine geologist at NOAAs' Pacific Marine Environmental Laboratory, noted that "since the water pressure at that depth supresses the violence of the volcano's explosions, we could get an underwater robot within feet of the active eruption." Imagery includes large molten lava bubbles ~1 m across bursting into cold seawater, glowing red vents exploding lava particles into the sea, and lava flows. Video images may be seen on a number of websites (such as NSF). Water from the volcano was very acidic, and Tom Shank, a biologist from the Woods Hole Oceanographic Institution, found that shrimp were the only animals thriving in the vent water near the eruption. The press release from NSF included a video of the volcanic explosions. Several papers pertaining to research conducted on the 2009 eruption of West Mata were presented at the 2009 American Geophysical Union Fall Meeting, 14-18 December 2009; titles and authors of abstracts are shown in the reference list below. References. Caress, D.W., Thomas, H., Conlin, D., and Clague, D.A., 2009, Fine-scale morphology of West Mata volcano and the Northeast Lau Spreading Center, Lau Basin from AUV multibeam surveys, American Geophysical Union 2009 Fall Meeting abstract V51D-1731. Clague, D.A., Rubin, K.H., and Keller, N.S., 2009, Products of submarine fountains and bubble-burst eruptive activity at 1200 m on West Mata volcano, Lau Basin, American Geophysical Union 2009 Fall Meeting abstract V43I-02. Huber, J.A., Cantin, H., Resing, J., and Butterfield, D.A., 2009, Microbial communities in erupting fluids from West Mata volcano, Tonga Arc, American Geophysical Union 2009 Fall Meeting abstract V41I-07. Keller, N.S., Rubin, K.H., Clague, D.A., Michael, P.J., Resing, J.A., Cooper, L.B., Shaw, A.M., Ono, S., and Tamura, Y., 2009, Sulfur in submarine eruptions: Observations and preliminary data from West Mata, NE Lau Basin, American Geophysical Union 2009 Fall Meeting abstract V43I-08. Lin, H., Cowen, J.P., Butterfield, D.A., Embley, R.W., and Resing, J., 2009, Dissolved organic carbon distribution in two hydrothermal systems ? West Mata, NE Lau Basin during an eruption event and basement fluids from sediment-buried Juan de Fuca Ridge flanks, American Geophysical Union 2009 Fall Meeting abstract B21D-06. Michael, P.J., Escrig, S., Rubin, K.H., Cooper, L.B., Langmuir, C.H., Clague, D.A., Keller, N.S., and Plank, T., 2009, Major and trace elements and volatiles in glasses from the 2009 Rapid Response Expedition to West Mata volcano and Northeast Lau spreading center (NELSC), American Geophysical Union 2009 Fall Meeting abstract V51D-1720. Resing, J., Lupton, J., Embley, R., Baker, E., and Lilley, M. (compilers), 2009, Preliminary findings from the North Lau eruption sites, informal report, 2/5/09 (URL: http://www.ridge2000.org/science/downloads/email/Nlaupreliminaryfindings25.pdf). Information Contacts: Ken Rubin, NOAA, University of Hawaii; National Science Foundation (NSF) (URL: http://www.nsf.gov/); American Geophysical Union 2009 Fall Meeting. West Mata, a submarine volcano rising to within 1174 m of the sea surface, is located in the northeastern Lau Basin at the northern end of the Tonga arc, about 200 km SW of Samoa. West Mata volcano lies about 7 km west of another submarine volcano, East Mata; both lie at the northern end of the Tonga arc, north of the historically active Curacoa submarine volcano. 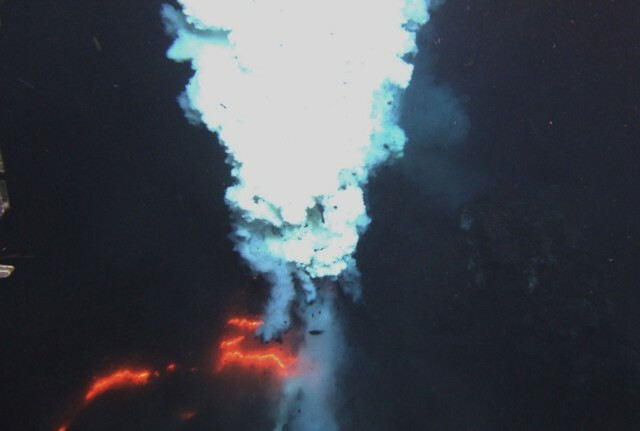 The two volcanoes were discovered during a November 2008 NOAA Vents Program expedition, and West Mata was found to be producing submarine hydrothermal plumes consistent with a recent or lava effusion. A return visit in May 2009 documented explosive and effusive activity from two closely spaced vents, one at the summit, and the other on the SW rift zone. Rubin K H, Embley R W, Clague D A, Resing J A, Michael P J, Keller N S, Baker E T, 2009. Lavas from active boninite and very recent basalt eruptions at two submarine NE Lau Basin sites. Eos, Trans Amer Geophys Union, 89: Fall Meet Suppl, abstr V43I-05. There is no Deformation History data available for West Mata. There is no Emissions History data available for West Mata. An eruption plumes rises from the Prometheus vent at Maka submarine volcano in May 2009. A November 2008 NOAA Vents Program expedition to the Lau Basin had discovered hydrothermal plumes from an actively erupting site on the summit of West Mata volcano. During a return trip in May 2009 explosive and effusive activity was observed from Hades, a vent on the SW flank, and explosive activity ejecting ash and bombs was seen from a cinder cone at the Prometheus vent at the summit. Courtesy of NSF and NOAA Ocean Exploration Program, 2009. Incandescence and a plume rise above the Hades vent of West Mata, a submarine volcano rising to within 1174 m of the sea surface, in May 2009. The volcano is located in the northeastern Lau Basin at the northern end of the Tonga arc, about 200 km SW of Samoa. It was discovered during a November 2008 NOAA Vents Program expedition, when West Mata was found to be producing submarine hydrothermal plumes consistent with recent or ongoing lava effusion. A return visit in May 2009 documented explosive and effusive activity. A NOAA Vents Program bathymetric map shows West Mata volcano, which rises about 1500 m from the sea floor at the northern end of the Tonga arc. Submarine eruptions were detected in 2008 and 2009 from two vents. The lower flanks of east Mata volcano are visible at the middle right. There are no samples for West Mata in the Smithsonian's NMNH Department of Mineral Sciences Rock and Ore collection. Large Eruptions of West Mata Information about large Quaternary eruptions (VEI >= 4) is cataloged in the Large Magnitude Explosive Volcanic Eruptions (LaMEVE) database of the Volcano Global Risk Identification and Analysis Project (VOGRIPA).